SPECIAL – Win a trip to Cape Breton Island! 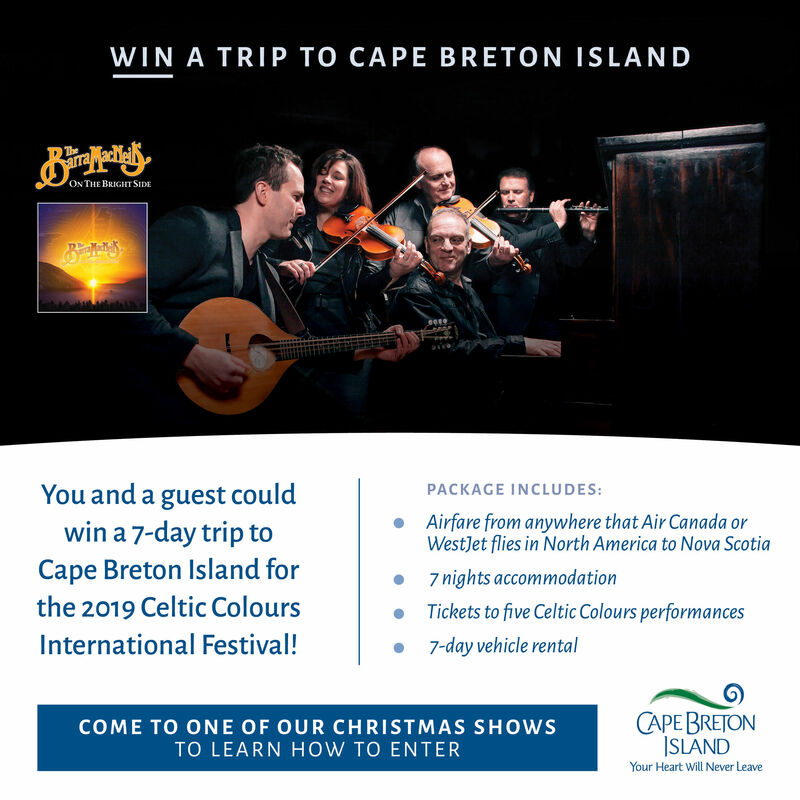 This year, anyone attending a Barra MacNeils Christmas concert will also have an opportunity to win a trip to Cape Breton Island through a partnership with the Island’s tourism organization, Destination Cape Breton. Details will be provided at each live performance. 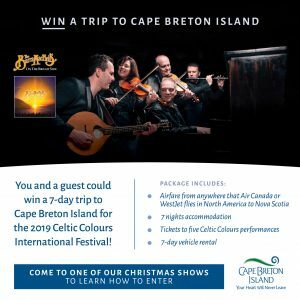 You and a guest could win a 7-day trip to to attend the 2019 Celtic Colours International Festival. The trip includes airfare, accommodations, car rental and tickets to festival performances. One of the most beloved concerts on the seasonal circuit, the Barra MacNeils East Coast Christmas features a highly entertaining mix of traditional seasonal fare along with entertaining stories and new musical twists; stamped with their lush harmonies and intricate instrumental stylings. Their show has been touring nationally, as well as in the U.S, for years to sold-out houses. Fans can look forward to classic favourites including: O Holy Night, Ave Maria, Christmas in Killarney and Auld Lang Syne as well as some comedy, seasonal stories, music, singing, dance and memories that will extend beyond the season and last a lifetime. The Barra MacNeils are widely regarded as one of the greatest live concert acts in the Celtic world. Their live performance offers a depth of talent that includes multiple lead vocalists, beautiful sibling harmonies, top-drawer instrumental talent on a wide variety of acoustic, stringed, percussion and wind instruments blended with dancing, storytelling, humour and Gaelic songs. It is family entertainment at the highest level. Their latest album, On The Bright Side, was released during the summer of 2018. This is an exquisite collection of everything Barra MacNeils fans love. An upbeat album ranging from familiar fiddle tunes to heart-wrenching Gaelic ballads. The album features distinctive family harmonies, an array of rhythmic instruments weaving through and around various themes – some decidedly classical but then, suddenly, very traditional Cape Breton – the lads singing a cappella and thoughtful solos that merge into all-hands-on-deck medleys. Experience the trademark passion and energy of The Barra MacNeils.